Cascade Canyon. The most popular and simplest access into the Tetons, it offers easy hikes and backpacking options. A great longer day trip is the 9-mile round-trip to Forks of Cascade Canyon. Access the canyon via a 10-minute boat ride (8–6 daily; $10 round-trip; 307/734-9227) from South Jenny Lake. Heron Pond and Swan Lake. A family-friendly 3-mile loop begins at the Colter Bay Marina and offers lake views and good bird-watching. For area map and info: Colter Bay Visitor Center (off U.S. 89; 307/739 3594). Colter Bay Lakeshore Trail. This level trail follows the bay’s shoreline, providing great views of lake and mountains. Distance: 2 miles. Difficulty: Easy. LSR Preserve. Opened in 2008, the preserve is the largest addition to the park in decades. Educational hikes lead from its state-of-the-art visitor center through forests to Phelps Lake. The Preserve offers various hikes ranging from easy to moderate in difficulty. nps.gov/grte or 307/739-3300. Kayaking and river rafting. Ten-mile Snake River float trips offer chances for wildlife viewing and photography; experienced kayakers enjoy the Snake’s challenging spots. Outfitters include Solitude Float Trips (daily through Sep 30; from $55; solitudefloattrips.com. For a complete list of rafting outfitters, visit nps.gov/grte/planyourvisit/boat.htm or oars.com for kayaking trips. Wooden Boat River Tours. 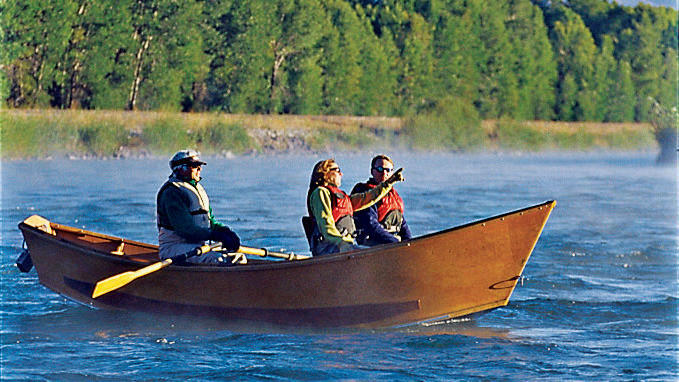 Take private tours by wooden boat on the Snake River with guide A.J. DeRosa. Plan a customized trip according to your interests from romantic Sunset Tours to Fishing Tours. Each of the tours includes beverages, snacks, and/or full meals with prices ranging from $400. woodboattours.com or 307/732-2628. Relax on the beach at Leigh Lake. For a strangely tropical setting beneath the Tetons, canoe or kayak north up String Lake until a short portage brings you through the forest to Leigh Lake. On Leigh, bypass the first island you come to and head north about a half-mile, to where a peninsula on the western shore juts out to form a tiny beach. (There’s a campground nearby too.) Where it is: From the Grand Teton National Park entrance at Moose, take Teton Park Rd. 10 miles north, turn left at N. Jenny Lake Rd. for about a half-mile, then follow signs to the String Lake trailhead. $25 per vehicle; 307/739-3300. Campsites from $19; gtlc.com or 800/628-9988.